Over at The Rosetta Project, we have been busy uploading new materials to our collection at the Internet Archive (which you can also follow by RSS feed). This week, we uploaded this grammar of Esperanto — a language invented by a single man, now used as a means of regular communication by thousands, if not millions of speakers! The language is the brainchild of Ludwik Zamenhof, an ophthalmologist from the city of Biyalstok (then part of the Russian Empire, now in eastern Poland). In the late 19th century, the city was divided between Germans, Jews, Russians, and Poles, who all spoke their own language. The animosity between these ethnic groups convinced Zamenhof that the key to understanding and harmony would be a common language. 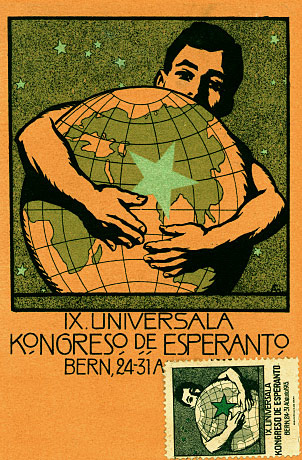 The structure of Esperanto (the name means, in Esperanto, “one who hopes”) reflects this ideal. The vocabulary, grammar, and sound system incorporate elements from all major European languages, and the structure is completely regular, making Esperanto very easy to learn. While the original goal of being a universally adopted language is still a bit far off, the Ethnologue estimates that there are 2 million speakers worldwide, with as many as 2,000 who learned Esperanto as their native language. That’s right, native Esperanto speakers. Couples who have met at Esperanto conventions will have no common language other than Esperanto, meaning that their children often grow up in an Esperanto-speaking household. The list of native Esperanto speakers includes a Nobel Prize laureate. Well and good. But why should you learn Esperanto? A whole wealth of culture would be at your fingertips, with over 25,000 books available (original and translated), and a 1965 horror movie starring William Shatner (a familiar presence to speakers of another artificial language, Klingon). Pasporta Servo is an international organization of Esperanto speakers in 92 countries who will give fellow Esperantists a place to stay. Akademio Internacia de Sciencoj (International Academy of Sciences) is an Esperanto-language university. Research has shown that learning Esperanto is a good stepping-stone into learning other languages. A pilot program in the UK teaches Esperanto to schoolchildren before they take on more complex and irregular human languages. The author of a “Complete Grammar of Esperanto,” Ivy Kellerman Reed, was an influential American Esperantist at the beginning of the 20th century, a time when ekscito was in the air, and the Esperanto revolution was heating up. Her preface to the book states “[This book] is to furnish not merely an introduction to Esperanto, or a superficial acquaintance with it, but a genuine understanding of the language and mastery of its use without recourse to additional textbooks, readers, etc.” All this can be gained in a tidy 345 pages, counting a small Esperanto-English dictionary in the back. The book also reads well using the FlipBook, a slick innovation by the Internet Archive. To any future Esperantists we may have inspired, we can only say Bonan ŝancon!